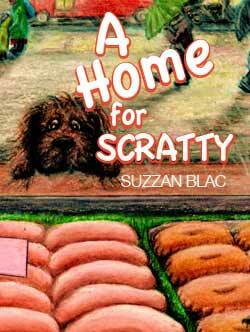 Scratty is a little orphaned dog who craves to be loved and wanted. Determined to find a loving home, he wanders far and wide in search of someone who thinks he’s special, to care for him and keep him safe. Along the way he meets some unsavory characters and finds himself in dangerous situations. One day, he finds himself near the water’s edge, and hears a little girl who’s swam out too far, cry for help. Scratty sets out to save her and drags her to safety. When he gets her back to shore he’s so tired from the swim that he falls fast asleep. Upon awaking, he finds himself in a comfy dog crate. Surprised, he notices a newspaper nearby whose headlines reads: Scratty, the hero dog saves little girl. Below the headline is a photo of the little girl holding him tightly, as her parents look on. Scratty realizes he has found the loving home and family he was searching for!